It is generally recommended that passwords should consist of at least 12 different characters, be complex and be automatically created. Rules set guidelines that can be made binding for users – meaning that the use of passwords with a certain level of complexity is enforced. Existing rules can also be reused in other areas. The following option is required to manage password rules. 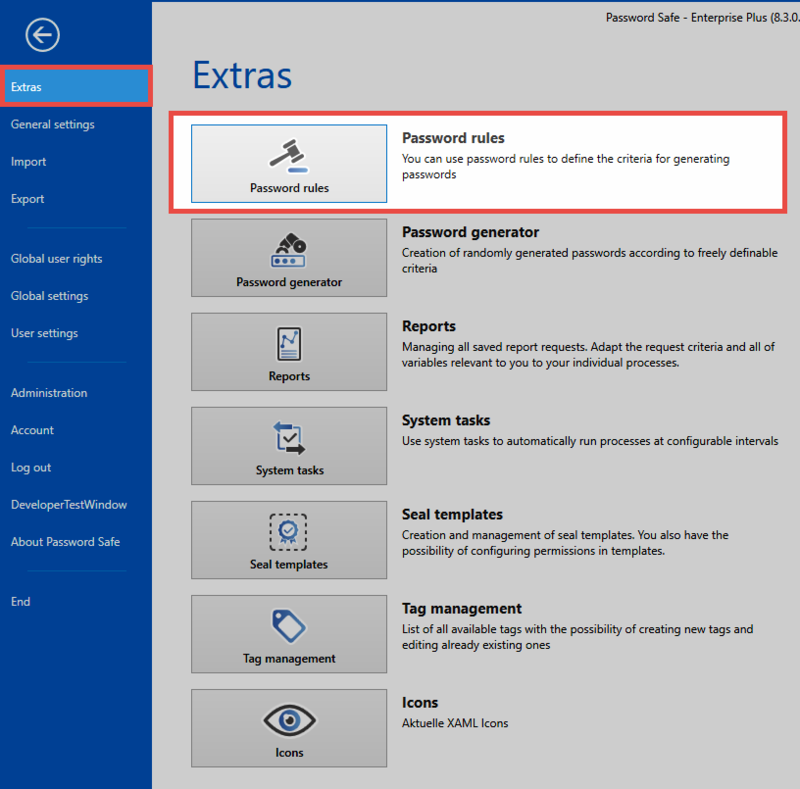 If “Password rules” is selected under Main menu/Extras, the available password rules will appear in a separate tab in the currently active module. 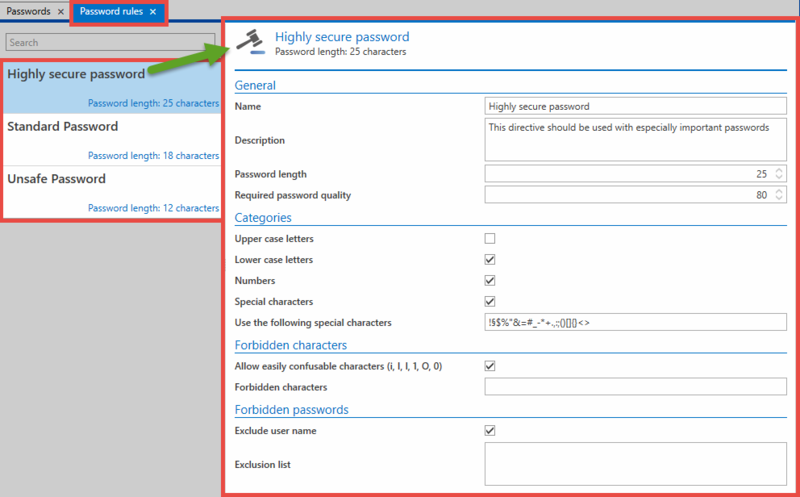 General: The Password length of 25 is the minimum number of characters that a password needs to contain according to this rule. The required Password quality is an internal measure of security, which is calculated for this rule. This value always lies between 1 (very unsecure) and 100 (maximum security). Categories: A password can consist of a total of four categories. It is possible to define which of these categories to use and also how many of them to use. Forbidden characters: It is also possible to exclude some special characters. These characters need to be entered in the list without separators. Preview rules: When new rules are created, an example password is generated that conforms to the configured rules. This is only the case for passwords with a minimum length of 3 characters! When a password field is defined in a form, one of the defined password rules can be set as the default. This means that the default will always be used when a new password is created. In this way, it is possible to ensure that the required level of complexity is maintained for certain passwords. 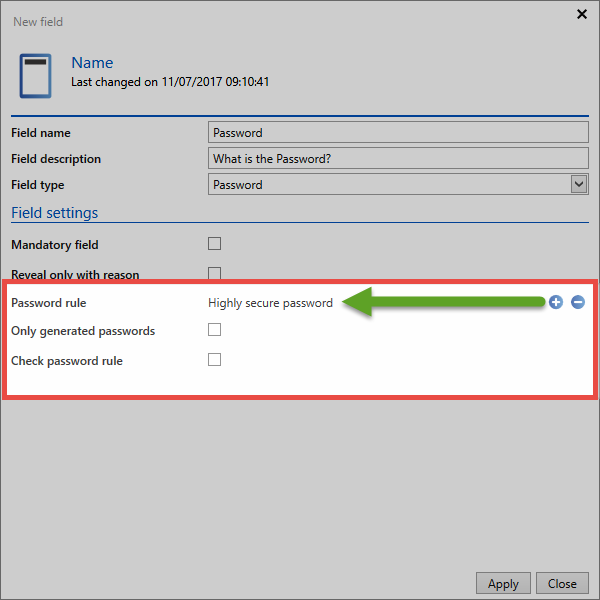 If one of these password rules is defined for a form, it is only possible to define a new random value for the password if a new password is created. The icon on the right hand side of the password field is used for this purpose. The password rules themselves are not subject to any permissions. All defined rules are therefore available to all users. The rules are managed from the Main menu.